What makes a community special is its members. Their actions and loyalty allow it to last and thrive. However, the magic won’t happen by snapping your fingers. Your audience needs good reasons to “meet and greet” regularly. One of them is the amount of giving without expectations. Another is the two-way, non salesy conversations. And there is also your willingness to make them part of your story. So, what are some tips a brand can use to entice people to “come for content and stay for community,” to quote Vanessa DiMauro? You ask one of the best communities around. Yes, I’m talking about you, #BizHeroes members. Feel free to add your own thoughts in the comment section. In 2006, there were about 35 million blogs in the world. Fast forward nine years; we are now at almost 300 million. And this is just the aggregated numbers for Tumblr and WordPress! There also more than 3.1 billion Internet users. How do you, as a brand or marketer, make the most of these numbers? As the #BizHeroes community will tell you, you start with the basics: Take a realistic look at the challenges in front of you. And when it comes to content marketing, there are quite a few. The most important one is identifying your audience accurately. Without that data, you will end up with more challenges on your plate. For example, you will have a hard time reaching readers at the right time and on the right platforms. Also, you won’t be able to address their pain points or tap into the emotions they crave with your content. Good content does not just serve. It also speaks to its recipients in a way that makes them want to “amplify and share”. #bizheroes A1: Seek to resonate rather than engage. When something resonates it shakes people up. In 2013, after British Airways had lost his father’s luggage on a flight to Paris, businessman Hasan Syed bought some promoted Tweets to chastise the airline. Many publications covered the news, which forced the company to apologize publicly. Before jumping on the social media bandwagon, big brands already had huge audiences. And these audiences naturally followed them on Facebook or Twitter. If you are a smaller business or a marketer, this scenario is unlikely to happen. You will have to dig to find your audience and initiate the conversation. So, instead of obsessing over ways to increase numbers, understand what is at stake. You are not in business to please everybody. Your goal is to build lasting relationships with the consumers interested in what you have to offer. 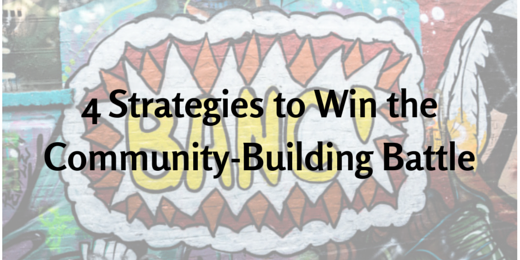 And the best way to achieve that is to focus on developing a micro-community. “So, how do I find my micro-community?” Glad you asked! You leverage social media, of course. On Twitter, for example, monitor specific hashtags, handles, and keywords; and join Twitter chats in your field. Consider other platforms too: LinkedIn Groups, forums, live streaming sites, etc. Scouring social networks for answers can quickly become an overwhelming affair. Fortunately, there are great tools to make your life easier, including Right Relevance, Google Alerts, Popurls, Bitly. Use them to find out the content that makes people tick and how well your own content is doing. There is a specific tactic, though, that will bring you some incredible results — ‘Link Listening’. Twitter Search is not the only tool to surface that data. Consider checking out Spider by oneQube, TweetDeck, HootSuite, and Twitter Analytics too! Another benefit of link listening is the ability to understand the content format your audience wants. And in 2015, chances are that it will be audio-related. In the U.S. alone, 46 million people listen to more than at least one podcast every month — or 21 million hours daily. There are several reasons for the success of that format. Podcasts allow multitasking. You can listen to them at your own pace and take them with you everywhere you go. When done well (as in educational and valuable), podcasts function as visibility boosters and advertising platforms, and will be recommended by others. …Especially with guests: “Give your guests all the information they need – make them feel comfortable – some people will be nervous.” (@CBarrows) – “Brief them so they know what to expect, involve your audience to send questions in advance so you guarantee listeners.” (@Liliholl) You can also send them a short list of questions. Invest in a quality microphone, like a Blue Yeti, Samson Go, Rode Podcaster USB, or Lavalier microphone. Use a good voice recording software and edit your podcast with a tool like Audacity. #bizheroes recording environment: use towels, blankets, cushions, moving blankets etc to deaden spaces with sound reflective surfaces. Last but not least, add an intro / outro to your recording. You can use Fiverr to get that last part done for you. Once you are happy with your podcast, distribute it to services like iTunes, Stitcher, Libsyn, and Souncloud, and embed the file on your blog. Next, create graphics with Canva to promote your podcast on social networks. Send an email to your subscribers. Upload a short teaser to YouTube and iTunes to entice people to listen directly on your website. If the podcast features a guest, don’t forget to send them a thank-you note. Finally, consider including a dedicated section on your site to help people find all your recordings and allow them to easily subscribe. That’s all for today, folks! I hope you liked the tips from the #BizHeroes community! See you next Monday for a roundup of must-read social media news. In the meantime, don’t forget to subscribe to the blog to receive our latest articles directly in your Inbox! Also, join us for the next #BizHeroes chat on Tuesday, April 21. We look forward to reading your insights! Massively helpful post, thanks Cendrine, that was a lot of work. It will take time to digest. What do you think is an important strategy to win the community-building battle?